It is likely that some of the sounds that are common in English are not used in your native language. The most common ones are 'r' as in 'right', 'l' as in 'light' and the 'th' sound as in 'thing'. 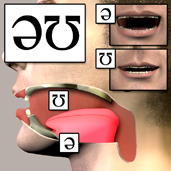 The 'th' sound, where your tongue is between your teeth is uncommon in other languages. 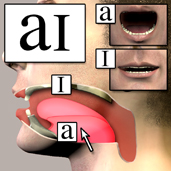 The other sounds that you will most likely find difficult are the 'moving vowel' sounds or "diphthongs". 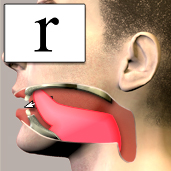 Notice that your mouth position changes considerably when saying this vowel. You start off with your mouth open and your tongue at the bottom of your mouth, and go to having your mouth closed with your tongue at the top of your mouth. It is very common for students learning English to have difficulty making both sounds. Many students pronounce just one one of these sounds, either the starting 'a' sound or the finishing 'I' sound. To speak well and be understood, you need to make both sounds. Your tongue needs to start off near the middle of your mouth, with your mouth open. Then your tongue needs to move back and up slightly at the same time as you close your lips. Your lips also need to be 'rounded' slightly. Hold your finger still - don't move it when your lips move. Now make an 'ee' sound. You should feel your lips come back to be flat against your teeth. Your finger should now not be touching your lips. Now make an 'au' sound sticking your lips out. You should feel your finger be pushed out, away from your mouth. This is what 'rounding' your lips means. Now say the word 'goat' with your finger touching your lips, and check that your lips become rounded at the end of the vowel sound. Well done! You are probably making the vowel sound correctly now. Pronouncing The "th" Sound In English. As you know, the 'th' sound can also be difficult. Can you see how your tongue needs to between your teeth so that someone watching you can actually see the tip of it? Many people find this strange to do, but if you do not "poke your tongue out" a little in this way, you will not pronounce the sound correctly. Usually, It's Better To Order "Rice" Than "Lice". The Difference Between The "r" And "l" Sounds. Your tongue curls up around the edges, and you blow air through the middle of your tongue. The top part of your tongue does not touch the top of your mouth. Your lips should be slightly rounded. The top of your tongue should touch the top of your mouth. Your lips should not be rounded. 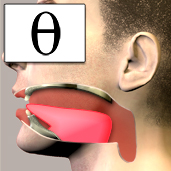 These images illustrate the difficulty in distinguishing the two tongue positions; however there are important differences.